Help Us Help Kids - Old McDonald's Farm, Inc.
Old McDonald’s Farm, Inc. would be thrilled to except your monetary or in-kind contributions. Cash contributions to scholarship low-income, at-risk children are always needed. These kids need our educational opportunities the most. In-kind items such as children’s rain gear, crayons, pens, poster boards, halters and leads for sheep and horses, saddles and bridals, et cetera are needed also. Your donation to OMF is tax-deductible as we are a 501(c)(3) children’s charitable organization. You can donate through our website if you wish. 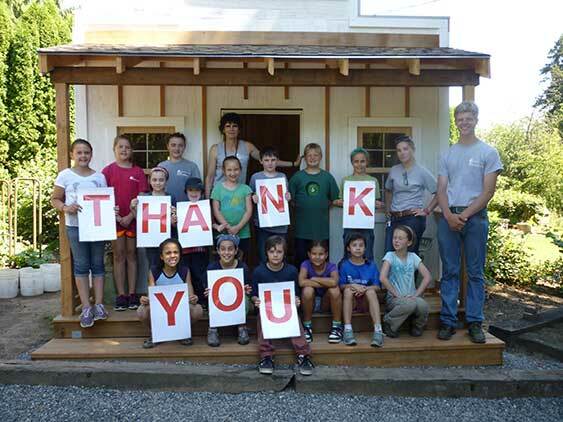 Park Place Wood Products, Inc.
Children’s Programs at Old McDonald’s Farm, Inc.
Hey Seniors! Would you like to enjoy the outdoors on a rural raspberry farm situated in Corbett? 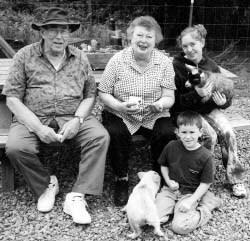 The farm is an easy drive from Portland or Gresham. Come and meet our farm animals and enjoy a great afternoon at Old McDonald’s Farm, Inc. Upon your arrival, you will first gather in the School House for an orientation to Old McDonald’s Farm, Inc. At that time, you will have a chance to pick up brochures about the educational programs we offer. Then you can head out to see the animals, garden and facilities. The Farm is handicap accessible. If you have difficulty getting around, however, we can lead or bring the animals to you. Lastly, enjoy a cup of hot chocolate or tea during question and answer time before you leave. How about a further opportunity? Would you like to help enrich the life of a child? Mentoring a child is a great way to positively influence his or her life! If this sounds interesting to you, please ask us for additional information. Old McDonald’s Farm, Inc. (OMF) is a nonprofit, charitable organization providing hands-on, educational experiences in a therapeutic farm setting. We offer our services to benefit all children in the Portland/Vancouver metropolitan area. Below is a description of three different ways you can volunteer with OMF. An orientation and training will be provided for all of the positions listed. Please call Stephanie Rickert 503/695-3316 today for more information! Whether you want job skills, school credits or just want to get involved in a productive way, you are needed at OMF. We offer people from a variety of disciplines (Business, Marketing, Education, Communications, Sociology, Psychology, etc.) a unique learning environment. Learn to manage a nonprofit organization. Learn to market and promote a business through media exposure, direct contact, public speaking, distribution of a newsletter, et cetera. Learn how to do books of account. Learn to motivate and empower people through volunteer coordinating. Learn human service skills by working directly with children, youth and adults. In addition, we utilize curriculum and lesson/activity plans to educate children and so OMF would be of particular interest to teachers as well. OMF offers much variety. At the same time, we can tailor this volunteer opportunity to your area of interest, credits needed and/or specific job skills wanted. All this and you can wear jeans too! Skills: Be very organized, have 110% follow-through, have a professional manor, have good writing skills, be creative, be resourceful, prefer experience working with children and web and computer experience. Job Duties: Build fences, light carpentry work, paint, plant trees, general maintenance and farm clean up, work with animals, plant, cultivate, weed or harvest the garden, et cetera. Skills: Be a hard worker, self motivated, organized and resourceful. Hours: Work hours can be flexible. Either ongoing projects or one-time project is fine. Job Duties: Implement curriculum, give safety orientations, give “meet the animals” and site tours, develop and implement children’s projects. Must be 18 years or older and have an extensive background check conducted. Skills: Have and exude a great attitude, be eager and willing to work with kids, be a hard worker and organized, have 110% follow-through, and be resourceful. Prefer experience working with children. Hours: Flexible work schedules are available.